If you have been reading food/cooking entries from the past, you would notice that I love to cook/bake. I cannot bake bread everyday but, I do love bread baking a lot. For me, bread baking is like comforting in many ways from kneading the dough, aroma while bread is being proofed or being baked,sound of crust when you slice into the bread.. There is something about the bread baking that makes the whole experience special. When I started baking bread,I got myself a book for bread baking,and I tried one type of recipe for French bread (Baguette) over and over until I get satisfied result from making one. I made so many French bread to learn the basic technique,and get to know more about bread baking in general. I find that making artisan bread has depth in learning and more technique,and I have got a lot more to learn about it. One of the restaurant we like to go to is called “Texas Roadhouse” and I love their salmon dish a lot. Our son Liam loves salmon dish too and my husband loves prime ribs there. That being said, no matter what dish we decided to get, one thing that we always can enjoy and love them is their roll with cinnamon butter. 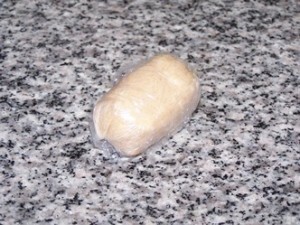 It is uniquely tad sweeter than Hawaiian roll, but not too sticky sweet and it has soft texture. 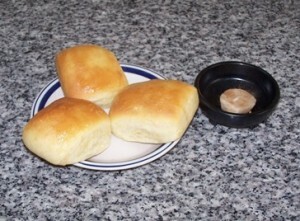 The cinnamon butter that comes with the rolls is die for. Our son Liam enjoys their rolls a lot too. 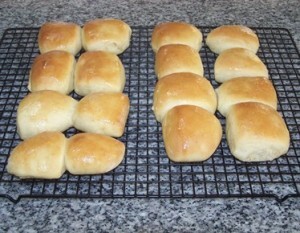 Just recently, I had fun trying to recreate their famous roll AND cinnamon butter. Liam reached out for the roll first and ate them all without play with roll time and it was a hit for him. Personally, I feel their rolls are a bit more sweeter than mine but if you make slit in the middle of the roll and place cinnamon butter and eat it,it tastes same so, I am happy with how it came out. In this entry, I would like to share the recipe with you so you too can enjoy baking their roll ad make their butter at home.I hope you like them. ** If you use jar of dry yeast, make sure the yeast is at room temperature. Cold yeast would not make your dough rise properly. 7.You can test your dough to see if you knead it more. Do the Windowpane test. Windowpane test is the test the gluten development in the dough. What you do is to cut off small piece of dough,and gently stretch out/pulling to see if it will hold a paper-thin membrane.If it tore apart,you would knead a bit more and do the test again. ** My husband likes to make slit from side like a pocket and smear the cinnamon butter in it and eat it.It tastes good!